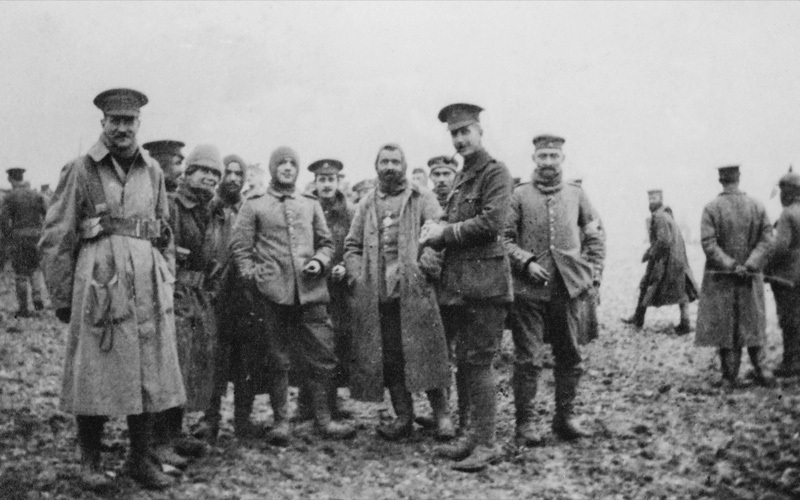 George Jameson recalls the moment when British and German soldiers stopped fighting and met in no-man’s land during the 1914 Christmas Truce. The survivors, and a continuous stream of reinforcements (largely Territorial and Indian soldiers), now held a line from just south of Ypres in Belgium, through Armentières and on to La Bassée in France. This was only a small fraction of the 400 miles of trenches that ran from the Channel to the Swiss border. 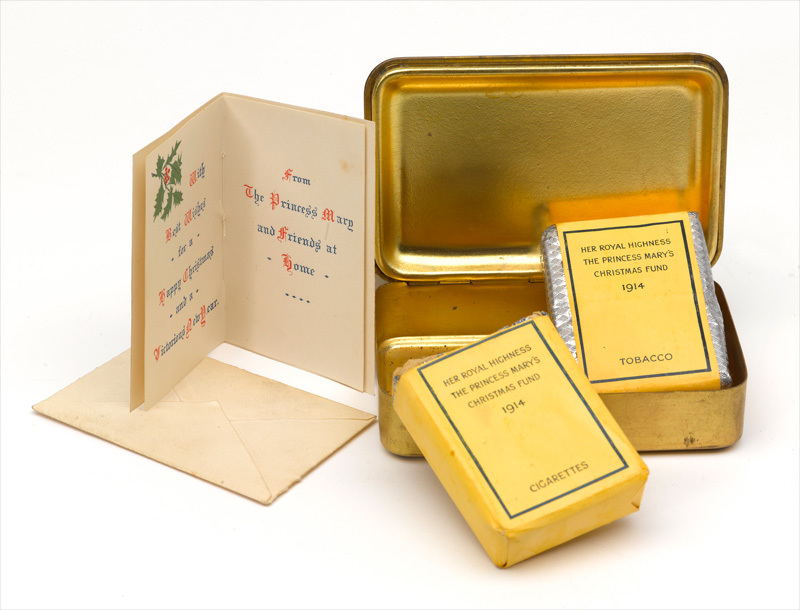 The soldiers along this front faced a freezing winter in the trenches and Christmas away from their loved ones. Around this time unofficial truces between British and German soldiers took place along parts of the BEF’s front. 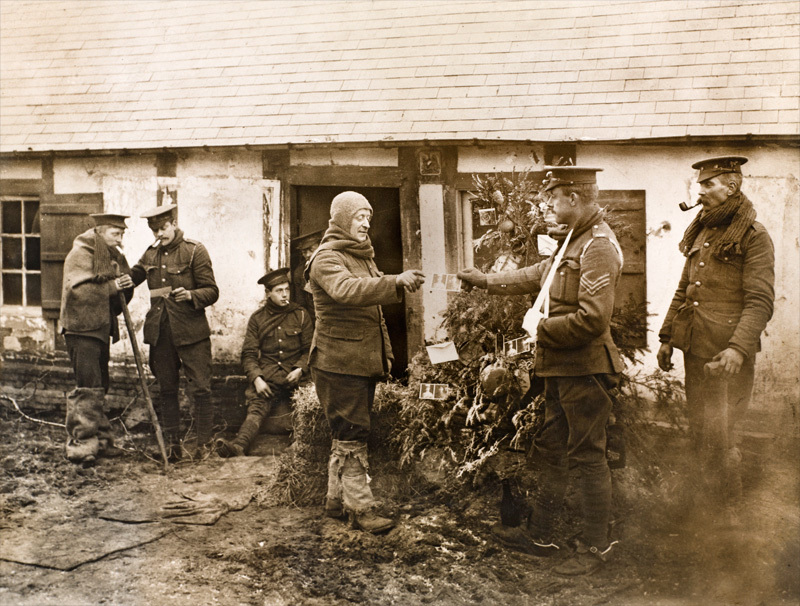 In the trenches on Christmas morning carols were sung and rations thrown across the opposing lines. It was not long before the more adventurous soldiers started to venture into no-man’s land. Here they exchanged food, tobacco, cigarettes, drink, badges, buttons and caps. Games of football also broke out. 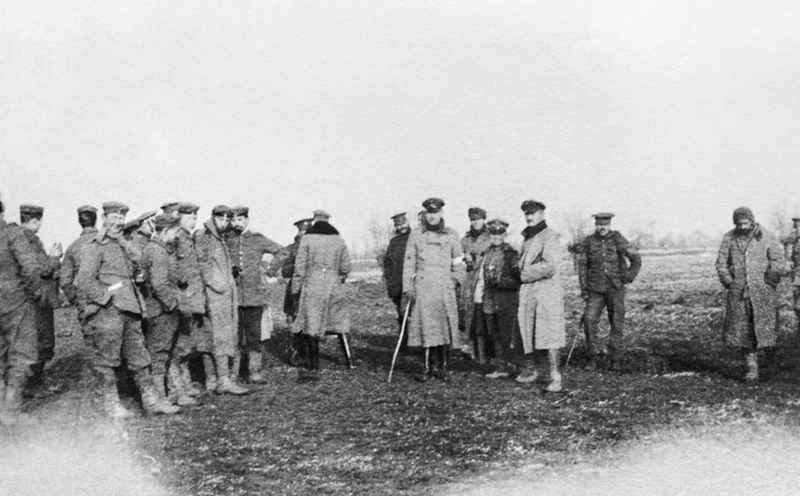 The only result recorded was a 3-2 victory by the Germans, quoted in several soldiers’ letters. 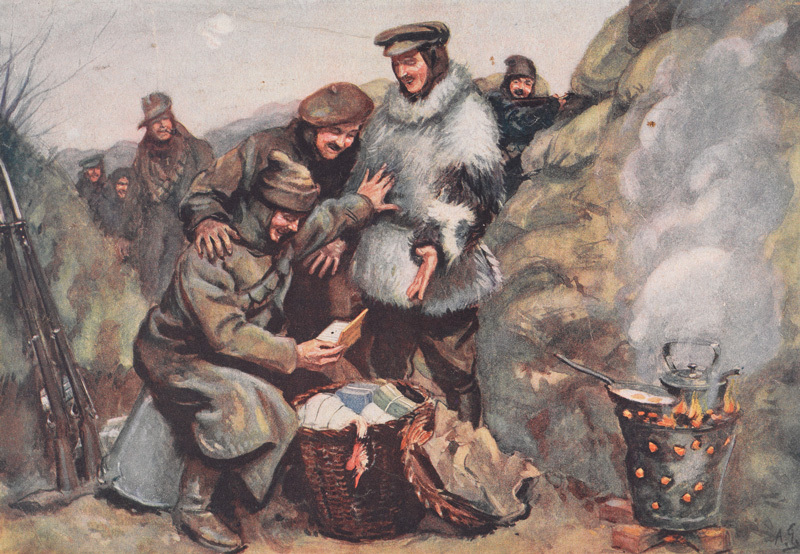 We were in the trenches on the Christmas Eve, and our squadron was relieved by B Squadron. We were back in rest billets. And we thought, oh good we’re out of the line for Christmas Day – that’s marvellous. And, of course I copped the job of Duty Corporal on Christmas morning. However, one of my pals in my section, he said the ration parties going back and forward to the front are saying the Jerries are walking around on the top. Well, I thought, he’s stringing me along! No, no, he was absolutely positive that the Germans are walking about on the top. There’s nobody fighting anybody – they’re going talking to each other! Well, I said, I can’t do anything about it – got copped for this job. But you go on off, if you like, and see what’s what. 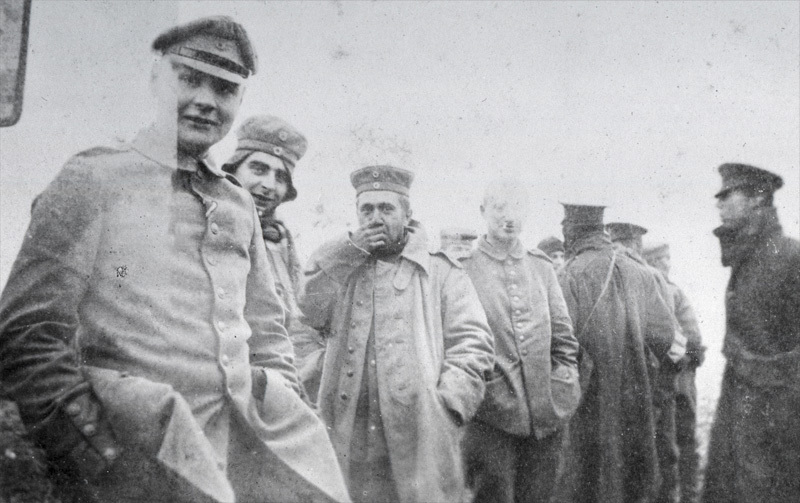 So they went off, and they came back, and one of them was wearing a Landwehr hat – you know the Landwehr hat? It was like a flat cap. Without a peak – grey and red. Do you remember? Had a sort of button thing on the front. And Keith came back with this stuck on his head, you see, on Christmas morning. And other lads who were also with him came back with a whole fistful of cigars. Yes – it’s a fact – our people are all wandering about on the top and talking and having a great old time. Of course, the General Staff didn’t approve of this? But as far as you were concerned, were you quite happy to see what was happening? You see, the general impression was the war was going to be over by Christmas, or very nearly that, you see – well this is part of the way towards it, you see – the war was going to be over. But the top brass soon put paid to all that, you see, and the Germans did the same thing, because they put their… we’d got a Bavarian regiment, I think, opposite to us at the time, and they were singing hymns – and of course I’d heard them singing, because I’d been in no-man’s land one night, listening patrol – they were singing all sorts of carols and things at that time. They weren’t wanting to fight or anything, none of them – they went through the motions, so to speak, but there was no real war going on, so it was very quiet in that part of the world. And, of course, the Prussian Guard came opposite to us, and they were all withdrawn. The Bavarians were taken away? Yes. Made a big difference. George Brumwell Jameson (1892-1999) was born in Newcastle in 1892 and educated at Dame Allen’s Cathedral School and Armstrong College, Durham University. After completing his education he joined Armstrong Whitworth and Co Ltd with the intention of becoming a naval architect. In 1910 he joined the Territorial Force, enlisting with Elswick Battery, 1st Northumbrian Brigade, Royal Field Artillery (RFA). In 1913 Jameson transferred to the Northumberland (Hussars) Yeomanry and following the outbreak of war in August 1914 he volunteered for overseas service. His unit sailed for Ostend in Belgium on 5 October 1914. On arrival it acted as divisional cavalry for the 7th Division. The hussars took part in the First Battle of Ypres in both a mounted reconnaissance role and as dismounted infantry. 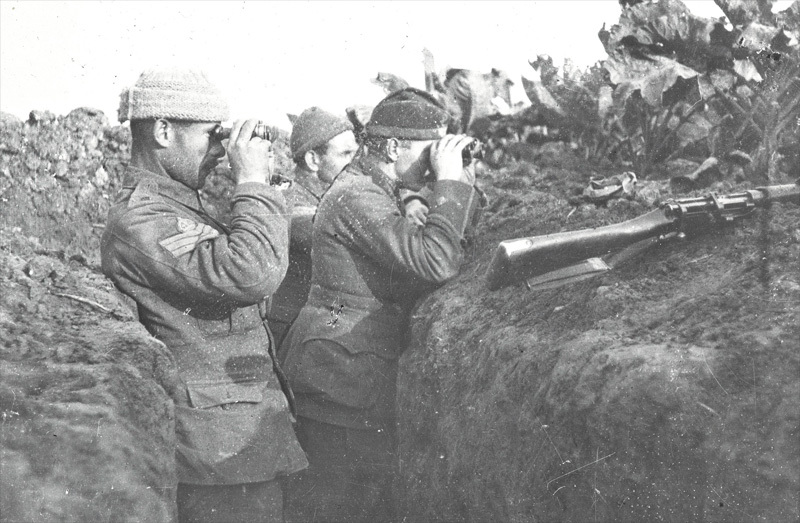 They spent the remainder of the year in the Ypres area engaged in trench maintenance and regular patrolling. By this time Jameson had been promoted to corporal. Jameson was eventually commissioned in December 1915 as a second lieutenant with the Royal Field Artillery. 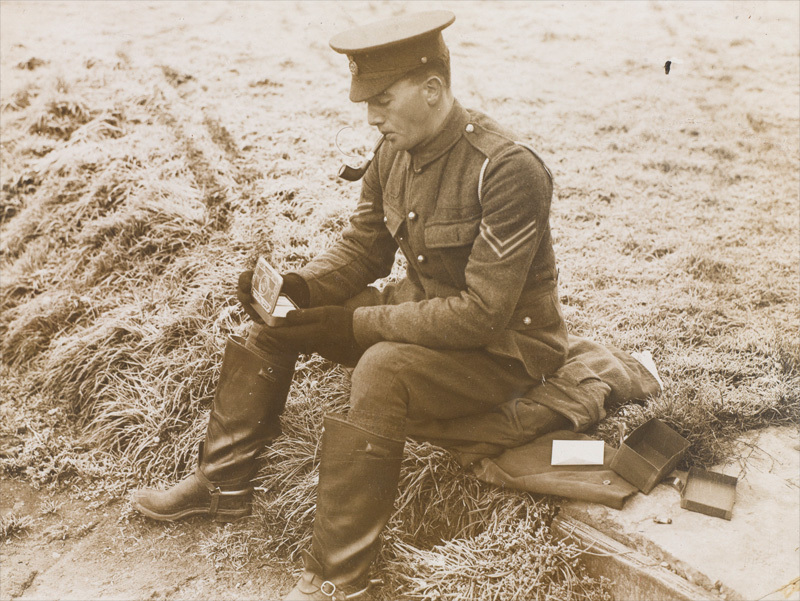 After training he returned to the front in July 1916 with ‘C’ Battery, 252nd Brigade RFA attached to 50th Division. Jameson fought on the Somme in September 1916, at Vimy Ridge in April 1917, and was promoted to lieutenant in July that year. His unit later served in Italy (November 1917 – April 1918) where he was awarded the Military Cross for gallantry on the Piave front. After leaving the Army as a captain in 1920, Jameson married and joined the Consett Iron Company, eventually moving to London. He returned to the colours during the Second World War when he joined the Hertfordshire Home Guard. Jameson later settled in Sidmouth, Devon, marrying his second wife in 1995. He died at Louth in Lincolnshire in 1999 aged 106.